Do you have flaws in your smile that you want to fix? You could opt for porcelain veneers, but that entails removing part of your teeth’s enamel, and the entire veneer procedure takes at least two appointments over the course a few weeks. Perhaps you can’t wait that long or you don’t want the permanent consequences that veneers bring. Well, there’s another simpler option that we offer at our New Lenox office that can boost your confidence in your smile again—dental bonding. Shape and length of teeth. Reparation of chipped or cracked teeth. Composite resin is a biocompatible, durable plastic material that adheres to and enhances your natural tooth. Also, it can be specifically shaded to match the tooth perfectly, creating the flawless smile you’ve always wanted. Your dentist will use a shade guide to determine the resin color they need. Then, they will make the surface of your tooth a little rougher to help the resin bond to the tooth. They next will apply the putty-like resin to the tooth, artistically mold it into the desired shape, and make it as smooth as possible. A light will harden the material in a short period of time. Afterward, your dentist will continue to trim and shape it, ensuring that it is polished like a natural tooth. Overall, dental bonding typically can take between 30 and 60 minutes per tooth. Quick results. Most of the time, the procedure can be completed in just one appointment. That way, you can get back to your life faster. Painless process. Except in special circumstances, such as a chipped tooth that is near a nerve, you don’t need an anesthetic for this procedure. Versatility. Like porcelain veneers, dental bonding can address many kinds of flaw, making it an especially ideal solution for those with multiple flaws in one tooth. Durability. 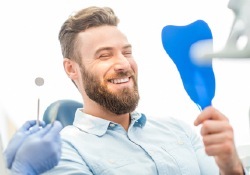 Although not quite as durable as porcelain veneers, cosmetic bonding can certainly withstand normal wear and tear, as long as you take good care of your teeth. Lasting effect. With diligent oral hygiene and routine dental visits, dental bonding can last for several years. Natural look. Your dentist uses a color guide to ensure that it matches your tooth’s color. At Atrium Family Dental, we know how important it is to feel confident in your smile’s appearance. Our talented dentists—Dr. Albert, Dr. Snow, and Dr. Stylski—and our staff are experienced at making patients smile happier. We look forward to doing the same for you! Contact us for an appointment today, so you can finally feel proud to show off your pearly whites.